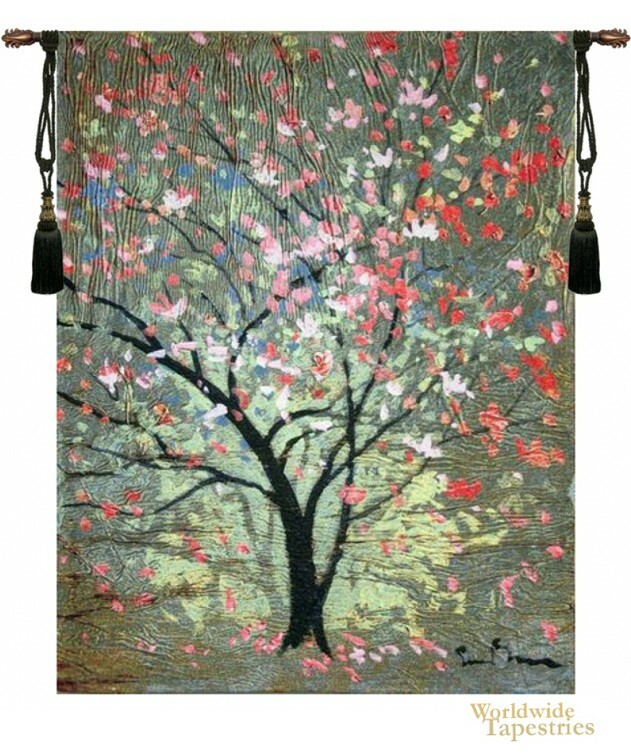 Here in this tapestry "Hopeful Tree" by Simon Bull, we see a tree of life in amazing color and sense of movement. Known for his dramatic use of color and flowers, the art tapestries of Simon Bull are exceptionally beautiful. Here we see a tree in florid bloom, bursting with colorful leaves and flowers as if a burst of energy into the skies. Simon Bull spent his childhood in Europe, South America, Southern China and was born in the United Kingdom in the North of England. He now lives in Monterey Bay in California. This work can be interpreted as a tree of life as the focus is on the life giving force of nature, in this case of the tree stretching to the skies and yet rooted into the earth. The branches and leaves of a tree of life represents life on earth. Simon Bull's work has a distinctive effect on art lovers, including that of deep appreciation of nature. This modern art tree of life tapestry "Hopeful Tree" is backed with lining and tunnel for easy hanging. Note: tapestry rod and tassels if pictured, are not included in the price.